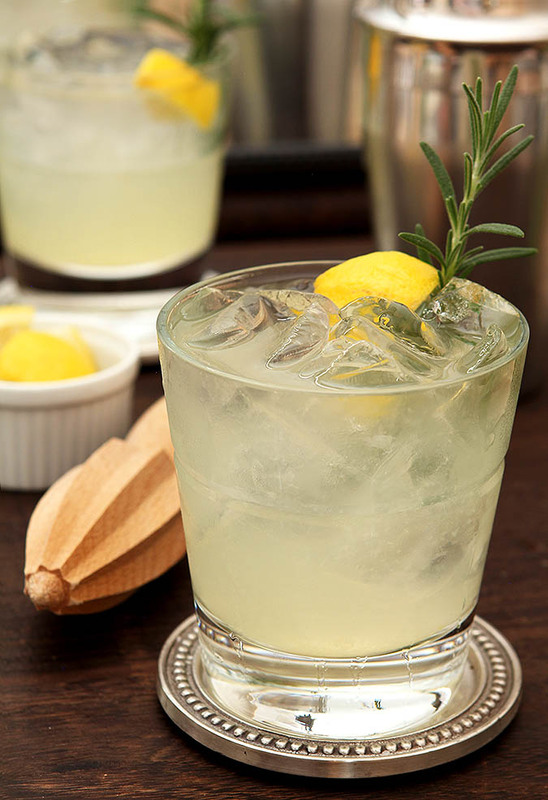 Sparkling Gin and Rosemary Lemonade will vie with Gin & Tonic to be your favorite summertime libation. Every week when I finish a post for Friday Cocktails I have a little conversation with myself about getting ahead a bit; promising that I will make another cocktail that same day and quit with the waiting until Thursday business. But that never happens and then Friday comes and goes too and the weekend seems to fly by with yard work and more and it’s Monday and it will wait until Tuesday and well…you see how it goes right? EVERY single week. I really must change that but it’s hard to plan ahead. I like to share when the spirit moves me…and sometimes none of them move me until Thursday. This week it’s Friday at 11:03am and the spirit didn’t move me until last night with this Rosemary and Gin Sparkling Lemonade. I had a plan for today; I have a great fall-centric cocktail that I made years ago for the blog that I wanted to redo it; seems every couple of years I look at old photos and cringe and can’t share something again without a redo (Ugh…small, horizontal AND I cut off the bottom of the coaster? Look for this one next Friday!). So I had a plan BUT (always a but huh?) I totally spaced that those two apples I thought I had in my fruit bowl ended up in the Boozy Apple Crisp I posted yesterday; deciding to make it a bit larger than normal. (Update – thought you might also enjoy this Bourbon and Apple Cider Cocktail that I did finally update!). Now I could have run to the store last night or even this morning but a quick text from a friend yesterday evening sort of saved the day. She let me know that a friend of hers was doing an event and planned to use a cocktail from my blog, the Ophelia, a Rosemary and Gin Sparkling Lemonade, as her signature cocktail. Great idea…and thanks for reminding me of just how much I love this drink! I actually was worried that all the photos were some awful, horizontal pics (all I used to shoot) but was pleasantly surprised that they were not totally awful but still, they made me cringe just a little so I did a re-shoot this morning. Hence my excuse for just barely publishing this post by Cocktail Hour (whatever time YOU start drinking!). I saved the goods for Amy and myself though; she is a willing taste tester and deserves one today for rescuing Friday Cocktails; her friend too! 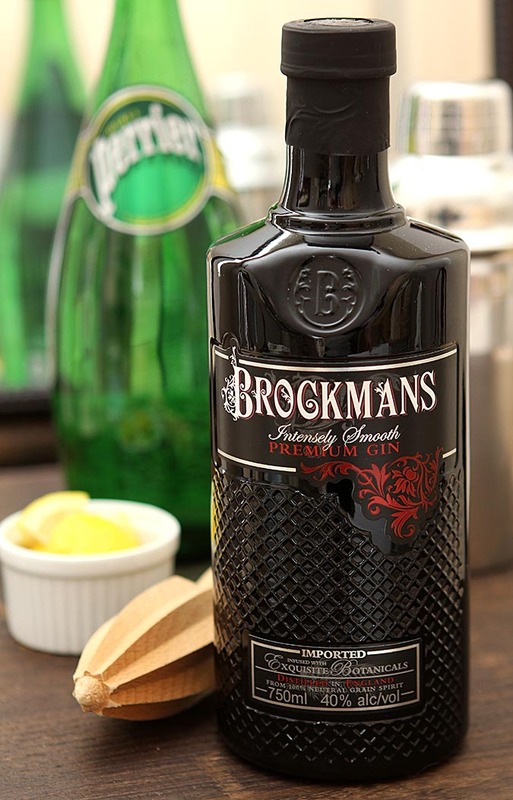 I recently received a bottle of Brockman’s Gin and this was a good opportunity to try it out. Distilled in London, this is no London Dry Gin. Billed as intensely smooth, what I noticed most was the light hand with the juniper and the evident presence of the blueberries and blackberries the distillery includes in their botanicals which also include Bulgarian coriander, Valencia orange peels, orris root, cassia bark, angelica root, almonds and lemons. I have so many friends that eschew gin because of the pine notes of the juniper so it will be interesting to see how this fares with them. Since mixing with a cocktail that already has the evergreen scent of rosemary I thought this would be the perfect use and it was. I can imagine it would also be terrific in a Bramble with blackberries and Crème de Mure. When I first published this cocktail, it was after being contacted by a magazine staffer from Denver’s 5280 Magazine. They had recently published a ‘Best’ list that was near and dear to my cocktail loving heart, ‘The 35 Best Bars in Denver.’ They wanted to know I would be interested in featuring one of the special cocktails that they discovered in this gargantuan effort. Of course I said yes but let’s be honest; they really should have contacted me BEFORE so that I could have helped them narrow down those decisions…don’t you think? I knew you would agree! My only caveat was that I preferred preparing a cocktail that would not require weeks of preparation (as in no home brewed bitters please). I wanted one relatively easy to prepare so that both myself and my readers could pull it together without having to search far and wide for ingredients. During my conversation with Natasha, the editor of the piece, it was suggested that I prepare the The Ophelia Cocktail from Olivéa’s, a restaurant and bar located in an area in Denver called Uptown; located east of Denver’s downtown area along 17th Avenue (so sad; they have since closed!). I have to tell you; this cocktail is a keeper. Combining the scent of Juniper berries in the gin with the herbaceous pine scent of rosemary in a simple syrup and then melding those aromatics with fresh lemon and club soda made for an excellent libation. The only change I’ve made over the years from the original recipe was to add a squeeze from a lemon wedge and put it in the cocktail as garnish with the rosemary. Probably stemmed from me having some leftover lemons when I squeezed the juice and it just happened. Totally optional too! This is a sophisticated cocktail that I am so glad I was asked to re-create. As much as I love the plethora of pink cocktails that appear on these pages from the bounty of fruits I enjoy incorporating into drinks, I’m delighted to have a less ‘girly’ cocktail in my repertoire…this is definitely a drink everyone will enjoy…Cheers! Strain the syrup through a fine mesh strainer into a container. (Should be a light golden syrup). 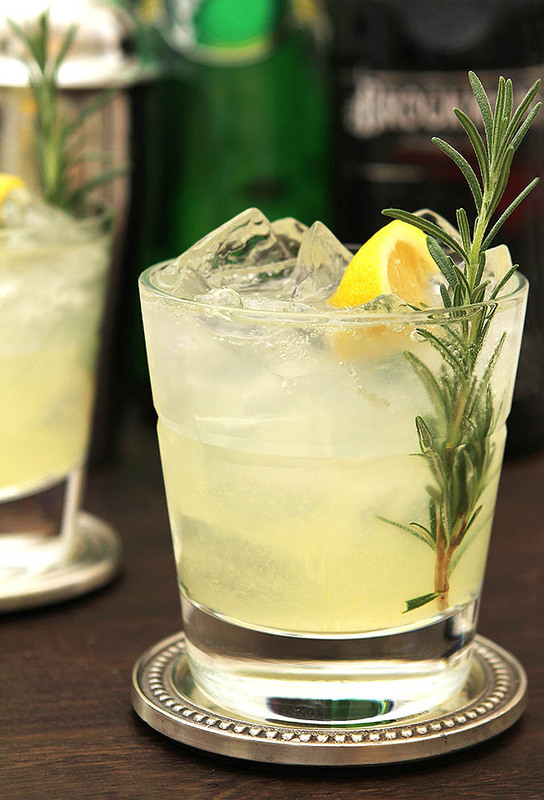 Top with club soda, stir briefly and garnish with a rosemary sprig and lemon wedge. I was provided with a sample bottle of Brockman’s Gin but all commentary is my own. I bookmarked this when I found it last year, but didn’t get around to making it until this weekend. I’m glad I finally did because it was really delicious! LOVE! I can’t think of a better use of fresh herbs (especially rosemary) than in a cocktail. YUM! This was just a great drink…will be perfect for summer too. Easy, touch of citrus and rosemary? Serious winner! This sounds like me in a glass. Seriously, it’s everything I love. I’ve made similar cocktails, but not quite this pretty. 🙂 I’ll need to try this version. Love it. So refreshing…counting down the months till I can have a proper cocktail again! It truly was…and would be worth the wait. I loved the juniper scent which makes it work for a cooler climate but I just know that doing it in summer with my homegrown rosemary will be equally fabulous. Holy Yum! I could have really used that last night! I like the burly cocktails but I also like the flavor a refreshing drink like this one. The rosemary syrup alone sounds incredible…so many things you could make with it. This drink reminds me of summer:) cheers! Looks like a very yummy cocktail ~ Thanks for sharing! This looks like my kind of cocktail! Can’t wait to be in the Cape this summer and make this! I am normally a wine drinker in the winter and do cocktails in the summer (well, mostly margaritas) but this effort each week has opened my eyes to some great new drinks. This is one of them. The juniper scent really does lend itself to a winter moment too…although this summer, it will be on my list too and have my very own rosemary in it! Looks great Barb. I’ll take one. 🙂 Happy Friday!!! I don’t think I need to tell you that this has my name WRITTEN all over it! I am plucking some rosemary this afternoon to make the syrup (hopefully) in time so that I can relax with one of these tonight! Gorgeous photos Barb – your photography is improving so quickly!!! It looks deliciously refreshing! Thank you for including the video on the making of this cocktail. It was a pleasure to watch, though I was surprised to hear that the Rosemary syrup should sit for approx. 45 minutes before mixing the cocktail. Good point to know if planning to serve the Opelia at a gathering. I was wondering if you know, once the Rosemary syrup is mixed up, do you know the shelf life for it? Your photos of the cocktail are again, absolutely wonderful and I think it is so great for you that companies are continuing to approach you regarding cocktails. I don’t have the answer to that Paula but I know I did cut the quantities cited in the video considerably to make a ‘home’ version. Just for you I went and measured what I had left and have found that this recipe makes enough for about 5 cocktails. Since I am already two down and have friends coming over tonight…I only wish I had more more! As someone playing Ophelia this summer, I am most appreciative of the literary origin of the cocktail’s name. Fantastic! I will definitely be trying this! Yes! Now this cocktail is most definitely right up my alley. My libation of choice has always been Tangueray, most often paired with tonic. A classic, sure, but now this takes it to a different level altogether. And with the weather we’ve had lately – 75 degrees and humid yesterday – this lovely cocktail would be wonderful. The video shows the bartender using and recommending Tangueray so that would be a perfect choice. I had Bombay Sapphire on hand and it’s what I used. That’s how I roll (specifically not buying a new bottle of something for one drink!). We have a place here in Cincy that does a gin drink with grapefruit juice and rosemary. So refreshing in the summer! Thanks for the post! I came VERY close to doing a grapefruit substitute but in the end decided to stay true to the original recipe…not always easy for me to do! The thing about this cocktail that struck me was how wonderful rosemary and lemon were in a cocktail when I would only previously have linked them together in a food dish. It is truly a keeper; just loved it.